The Models moisture in compreesed air enters into seperator tangentially and further it travel to pass through baffles which will results in spinning of air around inner seperator pipe. The water droplets are impinged on seperator wall by this centrifusal action. Thus seperates water droplets from air. Here speed of air reacues maximum at the bottom of seperator. Then air enters inner pipe resulting in change of direction, further seperation of droplets occurs. Then air will pass through demister pad, here moisture will seperated in wiremesh and small droplets will be seperated and collected at the bottom of seperator. It is designed on impingement principle & basic function is to separate bulk quantity of bigger oil & moisture droplets from compressed air. The separated oil & moisture gets collected in sump & further drained out effectively by providing suitable drain at bottom. 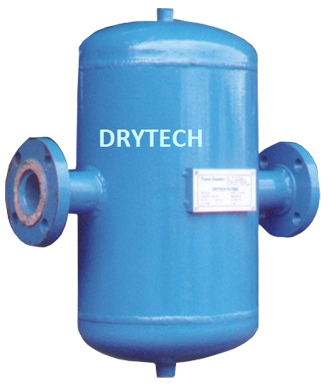 ½" to 12" line size at operating pressure of 16 Kg/cm2. After – After Cooler in between pipe line. Outlet of Compressor at coolest place on pipe line. * Note : Higher Pressure / Range can be offered on Request.